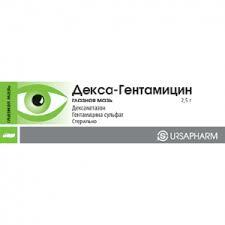 Dex-gentamicin eye ointment is a combination drug for the treatment of ophthalmic diseases. The tool is manufactured by the German company Ursafarm Artsnaimittel GmbH. The drug contains the optimal combination of antibiotic and glucocorticosteroid, which eliminates the risk of erroneous determination of dosages when administered separately. inflammations in the recovery period after surgical interventions (removal of cataracts, glaucoma operations, etc.). A strip of ointment with a length of 1 cm should be laid in the conjunctival cavity 2-3 times a day. When making applications, it is important to ensure that the tube does not touch the skin or conjunctiva. The use of several eye medications is acceptable. However, in such cases, Dex-Gentamicin should be laid at least 15 minutes after using the drops, but not earlier. The standard duration of treatment with ointment is 2-3 weeks. Usually this time is enough for complete recovery. Tree keratitis, chickenpox and other corneal viral diseases with conjunctiva. Mycobacterial infections of the eye. Acute purulent processes in the eyes with damage to the corneal epithelium. Fungal diseases of the eye. 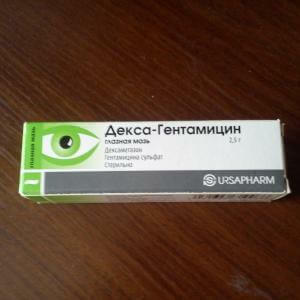 Age up to 18 years (there is no information about the effectiveness and safety of the use of the drug in the treatment of this category of patients). The manufacturer does not guarantee the safety of the use of the drug during pregnancy and lactation. Relevant clinical trials have not been conducted. Use of the drug in the II and III trimesters of pregnancy is allowed, but only with the permission of the doctor. He should conduct an examination of the patient and establish that the expected effect of treatment exceeds the possible risks to the fetus. aggravation of bacterial infection of the cornea. With prolonged use of Dex-gentamicin, there is a risk of developing secondary glaucoma and steroid cataracts. Therefore, after two weeks of continuous treatment and with a history of glaucoma, intraocular pressure should be measured regularly. If you find any side effects, you should immediately stop using the ointment and go to an ophthalmologist. The drug is available in the form of a yellowish translucent ointment. 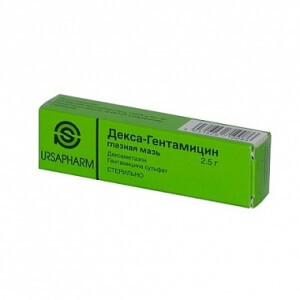 Packed in tubes of 2.5 g.
Dexamethasone is a glucocorticosteroid that relieves inflammation. It penetrates well into the corneal epithelium and conjunctiva. Gentamicin is an antibiotic that is effective against most gram-negative and gram-positive microorganisms. It does not enter the systemic circulation through the healthy corneal epithelium. Do not use Dexta-gentamicin simultaneously with Atropine and other anticholinergic or mydriatic agents. As a result of such combinations, intraocular pressure may increase. When applied topically, these agents can precipitate precipitates in the conjunctival cavity. After applying the ointment, visual acuity is sometimes disturbed, as a result of which mental and physical reactions are slowed down. Such phenomena are temporary. However, you should not use the ointment before you get behind the wheel or do the work associated with the mechanisms. The first half hour after application means you need to refrain from classes that require high concentration of attention. 3 years. After opening the tube can be stored no more than 4 weeks. Child-protected place, the optimum temperature is up to +25 degrees. Need a prescription from a doctor. A few years ago I had problems with the tear channel. I cured everything, but sometimes residual effects - tearing, itching in the corners of the eyes - sometimes disturb. 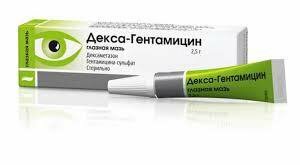 Rescue me Dex-Gentamicin ointment. It spreads all over the eye, it feels like a film, but there is no pain or discomfort. After a couple of causing itching and tearing pass.